History has few exemplars to be proud of. man-slaying Achilles” for the sake of a son. “bronze Anzacs” taught from birth not to cry. covering many-coloured garments with blood. did not teach a son to trust or respect his old man. my son, my son! Would that it were me instead of you. man of dust to be the all, the end, of the home. a child, afraid in the dark. yet not be controlled by the heart’s wild waves. and books sustained my mind. and Love deep, deep in time. Eliot and Herbert came later on. and the grace that strikes in anxious thought. so once again I’m led to pray. now my home and hearth expand. Lost of course and myself owing a death. All action as we enter our day, Auden suggests, is somehow driven by the fact that, as humans, we have desired and chosen a wisdom in ourselves, apart from God; we have desired a paradise which would have been given to us had we trusted but which we sought by our own merit and our own means and thus lost. This moment of decision, begun – and decided – for us in the Garden of Eden yet also enacted daily in every human choice, fascinated an anxious Danish philosopher-theologian to the extent that he used it as the very basis for his seminal – although at times nearly unreadable – thesis on anxiety. The philosopher was Søren Kierkegaard, a man whose name is nearly synonymous with anxiety or, as it is sometimes translated in his work, dread. The Danish word which he used, “Angest”, has a common root to our word “angst”, which is sometimes a synonym for anxiety yet often has something of a more metaphysical or existential connotation to it. Kierkegaard, often considered the father of modern existentialism, is no doubt also partly responsible for this fact. He did not write about anxiety that had a clear foundation in circumstances, though here it is helpful and important to distinguish anxiety from stress: Kierkegaard was not concerned with what we might call anxiety which is driven by something quite clear and located in circumstances. The kind of anxiety or dread about which Kierkegaard wrote had more to do with potentiality: with the possibilities which clouded the human mind, most of them to do with what we as humans were and are capable of. For Kierkegaard, this began in the Garden of Eden, with original sin. Once in a long while the father would look at his son and would see that he was troubled; then he would stand before him and say: Poor boy, you are going about in quiet despair; (but he never questioned him more closely; alas, he couldn’t, for he too went about in a state of quiet despair). Beyond that no word was ever breathed about the matter. But within the memory of man this father and son may have been two of the most melancholy beings that ever lived. We cannot know for sure that Kierkegaard’s own father-son relationship had any direct bearing on this story, and certainly he used his journals not only for personal disclosure but also as testing-grounds for ideas and modes of expression which would later appear in his published works. This story itself appeared in a slightly different form in his book, Stages on Life’s Way. Yet what he tells us in this chillingly simple story is that fathers and sons can so often keep one another in states of “quiet despair”. Kierkegaard would later call despair “the sickness unto death”, describing it as such because it caused the despairing subject to be altogether unable to find hope of transformation in God. In this way we see that despair and anxiety can be two ends of the same spectrum: anxiety lies when we see the potential for destructive action within us, and despair when such destructive action, occurring against or within us, has led us to a point of hopelessness. Yet both are based on the invisible and the inward: there was nothing objective to tell Kierkegaard’s father that he was cursed, any more than could be said of any other family that experienced suffering. Both anxiety and despair therefore seem to deal with the realms of possibility: either negative possibility, or the apparent absence of any possible good. Kierkegaard’s father despaired because he believed himself and his family cursed; his actions and choices seemed then to determine their future, and that future was an altogether helpless one. The possibility of this sickness [despair] is man’s advantage over the beast; to be aware of this sickness is the Christian’s advantage over natural man; to be cured of this sickness is the Christian’s blessedness. In possibility everything is possible. Hence in possibility one can go astray in all possible ways, but essentially in two. One is the wishful yearning form, the other is the melancholy fantastic – on the one hand hope; on the other, fear or anguished dread. For Kierkegaard, the kind of “panoramic view” which M. Ward describes is not always positive. We can go astray when we think of possibility in too “wishful” and ungrounded a manner. Yet more importantly we can go astray when we fear possibility. The panoramic view could hold any number of things, both good and bad, much as an agoraphobic will fear an open space for the dangers or threatening crowds that might soon occupy it. But why would we fear open possibility? Kierkegaard writes of such fear as the consequence of original sin. In a highly complex thesis, he explores how our sinful action now differs from original sin: “Adam’s sin”, he writes, “has sinfulness as its consequence”, whereas our sin “presupposes sinfulness as its condition”. That is to say, just like in Auden’s vision of waking to a new day, it has already been predetermined in humanity that sin will influence our actions and our decisions. Yet on-going human action perpetuates sin: “sinfulness is in the world only insofar as it enters through sin”’; that is, each time we sin, sin “enters the world”. It only exists in the world through sinful action, because, if it pre-existed human action, then it could only be said that Adam sinned because sin already existed, and thus he would not be culpable; nor would we. This is a line of argument which is bound to make many people’s heads spin, and some may feel more anxious on reading Kierkegaard’s account of anxiety than before they began. Yet there seems to be a very helpful thread within his thesis onto which we can hold: just as humans have been able to take a “qualitative leap” into sin, so too can we take an equivalent, though infinitely more liberating, leap into repentance and freedom. We feel anxiety when we stand at the moment of decision, when we recognise in ourselves both the desire for goodness and the impulse towards sin. In this vein, Kierkegaard defines anxiety as “freedom’s self-disclosure before itself in possibility”: anxiety stems from the possibility that something destructive may happen, and invokes fear through the possibility and the tension that it brings before it turns into reality. Kierkegaard notes that, because of our conflicted and corrupted natures as humans, we can feel anxiety both about evil and about good; neither sits comfortably within us, at the moment of decision. If we follow this line of argument, then anxiety, much like the ability to feel despair, can be a good rather than a negative force within us: “Whoever has learnt to be anxious in the right way has learned the ultimate” (emphasis added). 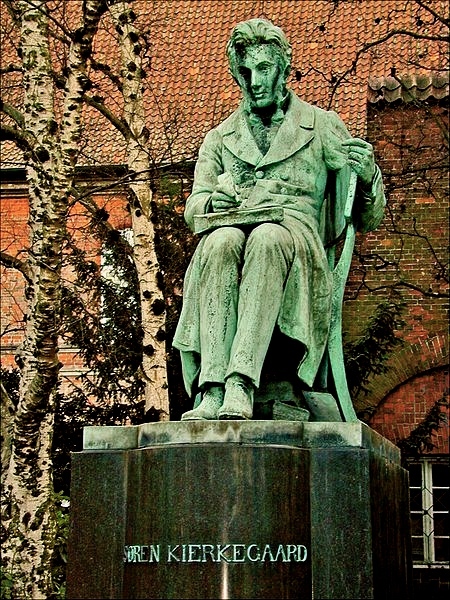 While we may not agree wholly with Kierkegaard’s polemical language here, we can hopefully still see the merit in what he says: that, when we learn to listen to what anxiety tells us – much like when we listen to pain and know that we should act to remedy our physical distress – we can use that moment of anxiety to turn towards God and away from sin. In this sense, Kierkegaard can take the rather radical step of describing anxiety as “saving through faith”. Making the clear distinction here that he is not speaking of anxiety which “is about something external” but rather in “the sense that it is the person himself who produces the anxiety”, he goes on to note that anxiety can in fact be seen to be “freedom’s possibility”. If sin is our preconditioned nature, then the fact that we feel anxiety over sin indicates that we have the potential still to turn from sin. Sin, however ingrained it may be within our natures, still remains a choice, so long as it has the potential to cause us anxiety. The man who can kill without any dread over the act he is about to perform has, in this sense, lost “freedom’s possibility”; there is nothing in his mind which enables him to recognise the moment of choice between sin and righteousness. There is, no doubt, a more nuanced theological discussion needed here, about the two natures of man and about the extent to which sin hardens us to the possibility of righteousness. Yet we see, for instance, in Paul’s account of sin in Romans 7 that the human heart is capable of swinging between a desire to do good and an inability to do so. This, of course, remains an impasse, so long as human strength is our only enabling force. The means by which anxiety about sin can be transformed into a positive, Kierkegaard writes, is “saving through faith”. In a powerful closing statement to The Concept of Anxiety, he declares that “the person who, in respect of guilt, is educated by anxiety will rest only in the Atonement”. There is a firm theological message contained in this brief statement: if we are “educated by anxiety”, we learn of our potential to turn from sin, but also know that it is only Jesus’ sacrifice which can enable that turning to take place. Otherwise, we are stuck simply in the moment of anxious potential, like St. Paul without Christ, doing what we would not do and unable to do the good that we would do. Kierkegaard, of course, knew very little about the science of the human brain. What we know now is still miniscule compared with what there is to know, yet we are still aware of facts which would, to some eyes, seem to negate Kierkegaard’s highly philosophical and theological thesis. Yet all that we say about the human brain, if we believe that we live in a fallen creation, can only be descriptive, not prescriptive. At best we can say, “Now the human brain appears to operate in this manner, and as a result we feel x in response to y.” We cannot say, “This is the way that humans were meant to be.” If sin, as Kierkegaard firmly believed, has corrupted our ability to choose between right and wrong and has left us anxious, then it seems perfectly plausible that scientists could still find evidence of this problem in a section of the brain – the amygdala, for instance, in matters of post-traumatic stress – which, broken by the cause of sin, now contains the effect. Anxiety which results from the sins of others, though different in its nature, has the same cause as the anxiety which Kierkegaard describes: we fear others, because we know what others can do to us, and our awareness of this has as much to do with our own ability to sin as it does the ability of others to do so. Bullies who become bullies themselves enact this fact daily: that the sin which occurs in another can equally occur in us, and lives on in acts of self-perpetuating, mutual culpability. Father in Heaven! Thou hast loved us first, help us never to forget that Thou art love so that this sure conviction might triumph in our hearts over the seduction of the world, over the inquietude of the soul, over the anxiety for the future, over the fright of the past, over the distress of the moment. But grant also that this conviction might discipline our soul so that our heart might remain faithful and sincere in the love which we bear to all those whom Thou hast commanded us to love as we love ourselves. Teach me, O God, not to torture myself, not to make a martyr out of myself through stifling reflection, but rather teach me to breathe deeply in faith. To that, we can only say: Amen. Auden. W.H. (1972). Collected Poems, ed. E. Mendelson. London: Faber and Faber. Auden, W.H. (1952). The Living Thoughts of Kierkegaard. New York: New York Review Books. Bolt, P. (2008). “Kierkegaard on Anxiety”. In B. Rosner, ed., The Consolations of Theology. Grand Rapids, Mi. : Wm. B. Eerdmans. Kierkegaard, S. (1993). The Diary of Søren Kierkegaard, ed. P. Rohde. New York: Carol Publishing. Kierkegaard, S. (1996). The Prayers of Kierkegaard, ed. Perry B. Lefevre. Chicago, Ill.: University of Chicago Press. Kierkegaard, S. (2004). The Sickness Unto Death, trans. A. Hannay. London: Penguin Books. Kierkegaard, S. (2014). The Concept of Anxiety, trans. A. Hannay. New York: W.W. Norton and Company. Ward, M. (2009). “For Beginners”. In Hold Time (Album). Merge Records. As October draws to a close, it’s time for an essay to draw together our month spent with W.H. Auden. He is a controversial figure in Christian poetry, and so this essay comes with a minor warning that it may not be to everyone’s reading taste. But he is, I think, still a rewarding poet to look at, for all his weaknesses and for some of the problems that he presents as a Christian writer. I hope that you all find it an interesting read. For my last Auden poem for the month, I have decided to fuse much of his poetry together in this homage to his work, great and humble alike. Along with the many famous, more memorable poems, Auden also wrote several poems which were kinds of collections of miniatures, poetic vignettes, sometimes sweet, sometimes stark and pointed. I have decided to pay tribute today to this, lesser-known side of his work. There are many poems which are referenced and which have inspired me in this poem – too many to name. The eagle-eyed Auden fan might like to spot them…it could be a fun weekend game…The first one has been done for you. to ambient chatter in café. attracts the trampling of eager feet. yet what expressed in the trampling? Feet powerful in the steps they tread? or how short the long black lasts. and every heart needs the exertion of bowing. the air smells just like winter. Forget, forget. The street will pass you by. In the afternoon, he walks the dog. beanie-clad, smart phone in hand. In a world enclosed, she is unknown. Books stay closed; computers flash. do not know the code. Margetson on the toilet wall. eager to be remembered, eager to forget? Your feet are clean, your steps may stop. The world has not touched you. You saw it all, the dive on fifty-second street your window. and found dirt within your own. has countries where no ships can go. Confucius says: the surface matters. but the gloss always reflects. which I would long to see. They saw no other eyes. What then? Does the young man lounge with pride? Does the sun reveal our splendour? No sun today; splendour then must hide. that he hates the lot of us. the town-square is their friend. Where, stranger, is your home? of goodness in my mind. Silence. Your footsteps deny the road. but your ears are a vacuum. but Christ hung on a tree. Forgive, forgive. Wrath, pass me by. which says, Thou shalt not kill. I will arise and see. One of Auden’s more challenging but also most remarkable poems is “Under Sirius”, written as a response to medieval Latin poet Fortunatus who, by Auden’s account, longed for humanity to experience some sort of tragedy to shake them to their senses. Auden’s inspiration came from the time known as the “dog days”, associated with the star Sirius, in which long, languid and hot days seemed to Auden’s Fortunatus to be symptoms of the inner death of humanity. If you are living in Melbourne, you may be better able to relate to a season which can’t make up its mind, which shifts from spring to autumn to winter and back to spring again, all in the space of a few days. So I have used this Melburnian weather pattern as the starting point for my poem. Before it break and drown…? And rain and autumn cling to spring’s façade. And our summer dreams ever calling. A quiet emptiness, a vacuum, saying, revealing nothing. At clouds both wise and arrogant. Into the sun long, long ago set. Yet lead soon back to always-here. The truths behind the languor finally appear? No reason for these rhyme-and-riddle seasons. Nonetheless the sun commits no treason. And made our ever-circling souls to stand.